President Barack Obama has done something no president of the US has done in public, outside of wartime, for more than a century. He has attempted to issue a personal insult to another country and its president by belittling both. At the Rijksmuseum, in Amsterdam on Monday, in front of Rembrandt’s “The Militia Company of District II under the Command of Captain Frans Banninck Cocq”, also known as “The Night Watch”, the White House arranged a photo opportunity. Obama spoke of the painting behind as “the most impressive backdrop I’ve had for a press conference”; claimed he had studied the Dutch Masters in school; thanked the locals for their hospitality, and moved on to a meeting with the Dutch Prime Minister while the media were dispersed. There was no press conference. The next day at the Gemeentemuseum in The Hague, Obama delivered his insult. 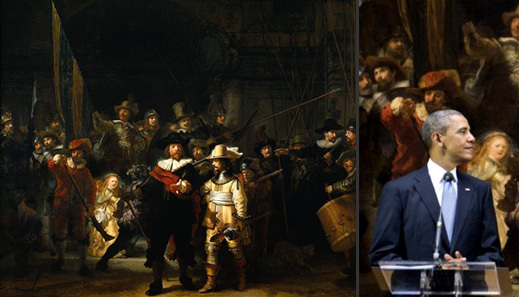 Press reporting of the words have been combined with photographs of the Rembrandt backdrop, although the two were 24 hours apart. Obama replied: “There are always going to be bad things that happen around the world. And the United States is the most powerful nation in the world. Understandably, it is looked to for solutions to those problems. And what we have to make sure we’re doing is that we are putting all elements of our power behind finding solutions, working with our international partners, standing up for those principles and ideals in a clear way. “There are going to be moments where military action is appropriate. There are going to be some times where that’s not in the interests, national security interests of the United States or of some of our partners, but that doesn’t mean that we’re not going to continue to make the effort or speak clearly about what we think is right and wrong. And that’s what we’ve done. The original White House recommendation for dealing with adversaries was Theodore Roosevelt’s in January 1900. “I have always been fond,” he said, “of the West African proverb, ‘Speak softly and carry a big stick; and you will go far.’” At the time Roosevelt was Vice President, and the adversaries he was thinking of were the Spanish colonies in the Caribbean. No one has ever found evidence of the proverbial source; Roosevelt probably invented its African origin. Obama, and his would-be successors in the 2016 presidential campaign, want to appear to be talking tough. Obama appears to have calculated that by diminishing Russia and President Vladimir Putin, he is correspondingly enhancing his own stature. There was no background check of Capt. Cocq (right) by the White House before it positioned the president for their Old Master ploy. In 1642, when Rembrandt van Rijn was commissioned to paint Capt. Cocq and his militiamen, Cocq had managed to overcome modest shopkeeper origins, marrying into the family of one of the founders of the Dutch East India Company. Their fortune he expanded into shipping, commodity trading, and real estate. Eight years after the painting, he became burgomeister of Amsterdam. Historians of the period describe the city, and the surrounding county of Holland, as an oligarchy run over several generations by Cocq and his business partners. The commercial foundations of their business had been transformed from domestic industries – farming, fishing, brewing and textiles – into international arbitrage operations, buying cheap abroad and selling dear at home. Their success had one crucial pre-condition – economic sanctions imposed by the Spanish monarchy intent on preserving its own commercial advantages and trade concessions. The Spanish sanctions forced the Dutch into the West Indies, East Indies, and New Amsterdam (New York). That shift in business plan, and Cocq’s power, would have been impossible without the miscalculated sanctions campaign of the kings of Spain. The militiamen Cocq is portrayed as leading out on community watch weren’t a state soldiery in the modern sense. None of them is recorded as having fought in combat. All volunteers, they were a cross between municipal police, firemen, street wardens, and army reservists. Since they were obliged to pay for their uniforms and weapons, the individuals Rembrandt portrayed were wealthy. They go to pains to demonstrate this for Rembrandt – and each of them paid to get their faces and symbols of affluence exactly right. In modern value, the men in the portrait subscribed €1,100 for inclusion; Rembrandt took a total fee of €20,000. In addition to Cocq’s intended advertising of his personal power and success, the symbols and allegorical meanings Rembrandt put into the picture have been much speculated about. The costume colours reportedly symbolize the leadership of the Dutch protestants over the local and Spanish catholics. The woman in gold and blue is thought to be a youthful likeness of Rembrandt’s wife, Saskia van Uylenburgh (right), then dying of tuberculosis. Look closely: she is depicted as the female mascot for Cocq’s male company. The chicken claws in her belt are believed to represent the arquebus, the firearm the militiamen carried with its distinctive claw-trigger mechanism. Then there is the recent documentary film on the painting by Peter Greenaway. He speculates that Rembrandt took the money of the militiamen, and gave them what they wanted to hang on the wall of their headquarters. 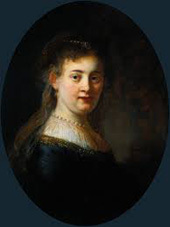 But by positioning, gesture, colour, and chiaroscuro, Greenway claims the canvass carries Rembrandt’s allegations against Cocq and his company for pedophilia and child prostitution, homicide, money-laundering, and political corruption. Oligarchs then, oligarchs today are hardly strangers to this sort of thing, nor is the geography of their operations restricted to one side of the Atlantic. For the US President to think he was standing tall in front of a tableau representing sanctions-busting by 17th Dutch criminals is, however, a monumental miscalculation. It’s also a subliminal warning not to believe what you think you see.